Quilting is one of the growing sewing practices that can help you create a comfortable and warm blanket. If you have been practicing the basic quilting technique, you should start considering upgrading your quilting skills to another level – the free-motion quilting technique. What is a free-motion quilting? Unlike the basic, where quilting is simply sewing numbers of patterned fabrics together to create a thicker and warmer structure, the free-motion is a unique quilting technique, where the stitches are added in any direction, but in a creative way. In a traditional way of sewing, the feed dogs are responsible for moving the fabric for every stitch; these are usually found underneath the footplate, which usually has several teeth. In the case of free-motion quilting, you have to lower your feed dogs and install the darning foot. This will allow you to freely move your fabric; experiencing zero resistance from the machine. One of the basic rules in any forms of sewing is using the same type of the top and bobbin’s thread; this is to create good quality stitches. 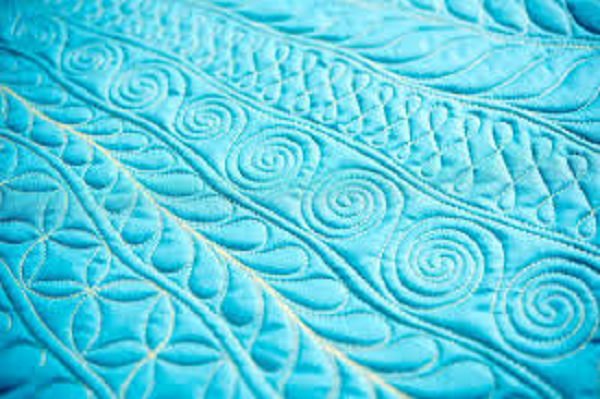 According to the experts, one of the biggest mistakes in free-motion quilting is using different threads for the top and the bobbin; there is nothing wrong with using different colors of threads, in fact, it will add another flavor to your quilting design, but having a different type or class of thread is another story. One of the obvious problems of having a different thread in free-motion quilting is the snapping of the thread; if the thread of the bobbin is too thick than the thread at the top, chances are, the thread stitched at the bottom of the fabric might snap, which have a similar effect if vice-versa. To make it easy, try using thin and blending threads. It will hide any of your free-motion stitching mistakes. Practice makes perfect; although it is tempting to immediately dive into a larger free-motion quilting project, practicing using smaller scraps enables you to become confident on a larger scale of quilting. If you are a beginner, you should start with a simpler design. If you are confident enough with your work, you may proceed with some tricky, but a creative type of quilting design. Always work with a plan. Try sketch out your design on a piece of paper. Even though it is called a free-motion quilting procedure, you should never forget to incorporate planning, because this will help you finish up a better quilting result. Quilting can be tough sometimes, but with determination and positivity, all your quilting ideas will turn out a success.